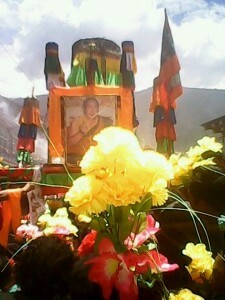 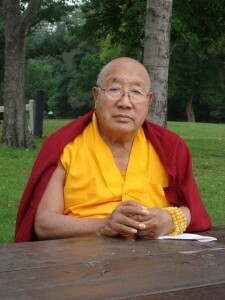 On the auspicious day of the 18th March 2011, His Holiness Karma Kuchen Rinpoche enthroned the sixth batch of Khenpos and Vajracharyas. 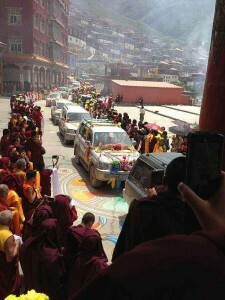 There were one hundred and ten graduates from Ngagyur Nyingma Institute (NNI), the prestigious branch University of Namdroling Monastery who were the recipients of the highest degree. 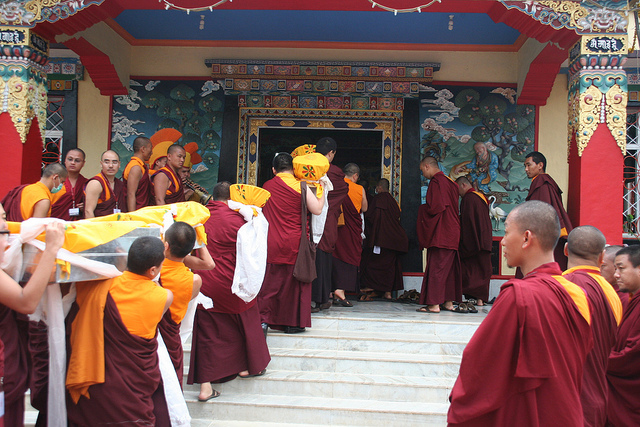 Similarly, there were eighteen Lamas who have completed their three-year retreat, as well as service for the monastery, and were worthy recipients of the Vajracharya degree. The enthronement ceremony started at 9.30 am when all the degree recipients proceeded in a line towards Zangdog Palri Palace. In front of the holy body of the late His Holiness Penor Rinpoche which is preserved at the Nirmanakaya Temple of Zangdog Palri, the recipients took oath in the presence of HH Karma Kuchen Rinpoche, HE Gyangkhang Tulku Rinpoche, HE Muksang Tulku Rinpoche, Khenchen Pema Sherab Rinpoche, Khenchen Namdrol Rinpoche and Khenchen Tsewang Gyatso Rinpoche. 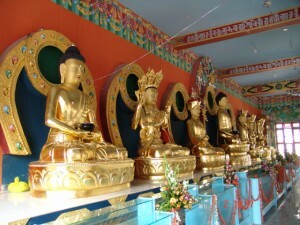 At the main temple, Padmasambhava Buddhist Vihara, Kuchen Rinpoche performed the enthronement ritual and then conferred the degree as well the ceremonial hats both of Khenpo and Vajracharya to all the worthy recipients. Kuchen Rinpoche and Khenchen Pema Sherab gave spiritual advice to all the newly enthroned Khenpos and Vajracharyas to preserve their identity and to work hard to fulfill the wishes of the late HH Penor Rinpoche. 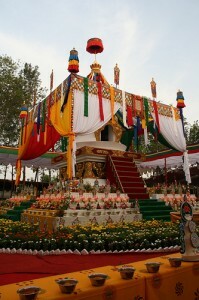 This was followed by offering of khatas (ceremonial scarves) to the Khenpos and Vajracharyas. 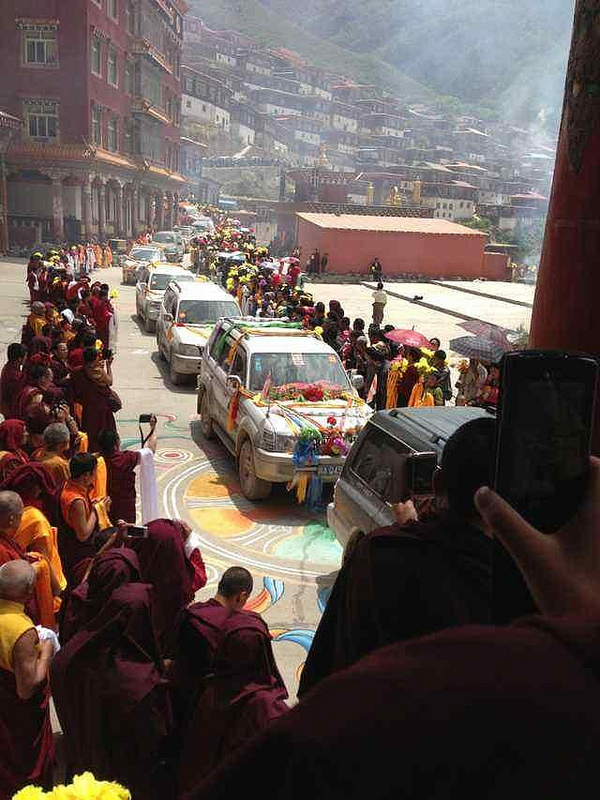 In the afternoon at 1pm, the Khenpos and Vajracharyas made mandala offering to HH Karma Kuchen Rinpoche and also offered ceremonial scarves to the three main Khenpos and two main Tulkus as a token of gratitude.